Ben Wilson is otherwise known as ‘the chewing gum man’. His distaste for industrial waste, cars and rubbish has turned into an art form. 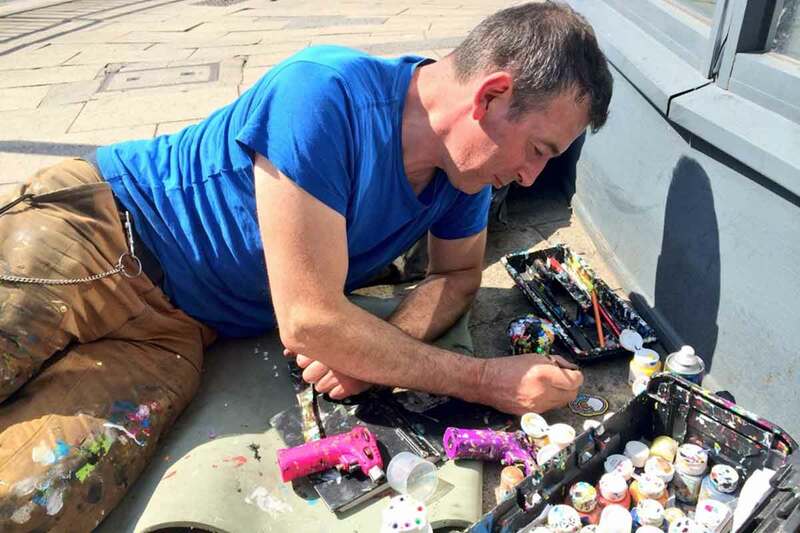 He creates tiny works of art by painting gum stuck to the pavement, most recently creating a trail from St Paul’s to the Tate Modern across the river Thames. His work has garnered him unwanted attention from the authorities, but is increasingly becoming accepted and admired as art on the streets of London. Ben also paints and sculpts. He has exhibited his paintings and sculptures in England, the United States, Germany, Ireland, Finland, France and Serbia. A woodcarver by trade, Ben started experimenting with occasional chewing-gum paintings in 1998, and in October 2004 began working on them full time. He has created more than 10,000 of these works on pavements across the UK and Europe. Most of his work is found in Muswell Hill, most recently creating a trail from St Paul’s to the Tate Modern across the Millennium Bridge in London. Spending up to ten hours painting colourful designs and pictures onto gum, it is first heated with blow torch and then treated with lacquer after painting. Always working in recycled art, his distaste for industrial waste, cars and rubbish has turned into an art form. am upset by all the garbage and sense of disconnectedness where people just affect things in a slightly detached way. When people detach from the environment, that’s when the environment gets destroyed and that’s also when people destroy each other. When a person throws chewing gum, it’s a thoughtless action. I’m turning that around. People think they don’t have an effect. But all the people that chew gum and throw it on the street, they created that. Once painted, it suddenly takes on new meaning and has been given the kind of worth that would otherwise be unthinkable. There is a pretentiousness about a lot of art that can be intimidating. What we are doing is taking it out on to the streets so that everybody can see it and everybody can enjoy it. It is all about bringing art out of the gallery and onto the street. My work evolves out of the place in which I work. Rather than imposing the idea on the place, the idea comes out of the place. I’m doing work that’s for the people. It’s about social cohesion. Every time I do a picture for a different person, it’s making links between people. It’s vital we think more deeply about our human connection both to nature and one another.